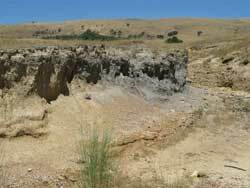 The upper Bet Bet Creek catchment in north-central Victoria is an erosional upland landscape (formed on Palaeozoic metasediments) typified by a high degree of variability in the nature and distribution of soil/regolith materials, landform evolution and salt stores. 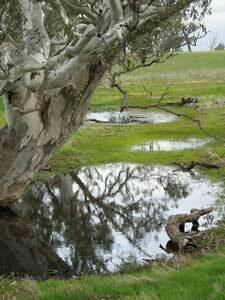 The catchment (average annual rainfall of 620 mm) is a significant contributor of salts to the Loddon River. Multi-disciplinary work has generated an improved understanding of this landscape by combining studies of landscape evolution, geomorphology, geology, pedology and hydrogeology. This virtual landscape poster focuses on one section of a sub-catchment in the upper Bet Bet creek catchment that contributes a relative high amount of soluble salts into streams. This work is based on a poster: Imhof, M., Rees, D., Crawford, D., Boyle, G and Clark R (2008). 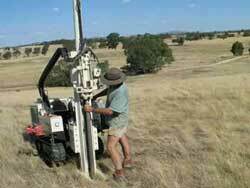 Soil and landscape assessment in the upper Bet Bet Creek catchment in North-Central Victoria. Australia/NZ Soils Conference, Adelaide 2006. We've detected that the 'Flash Player' installed is either missing or not fully up-to-date and cannot play the content we've created. For the best viewing experience please click on the icon above to install Adobe's Latest Flash Player. An interactive visualisation of the landscape in the upper Bet Bet Creek catchment is provided here. Zooming and panning functionality is provided as well as the ability to click on icons to provide further information about the landscape (e.g. soils, geology) as well as access other panoramas in the study area. Each of the six available interactive landscapes are 3 MB in size, this might take some time to automatically download if you're using a slow internet connection. If you experience any problems you should update the 'Adobe Flash Player' used. This software can be downloaded for free from the Adobe website (external link). If you experience any problems with this panorama, left mouse mouse click in the white space outside the panorama an simultaneously press 'Ctrl' and 'F5'. Construction of a dam bank (probably to dam the stream - an activity associated with late 19th Century gold mining practice) in the late 1800's or early 1900s resulted in diversion of the existing stream channel in this upper tributary of the Bet Bet Creek. Following extensive clearing in the first half of the 20th Century, gully and tunnel erosion has accelerated and the former stream channels are now extensively eroded. As this upper tributary stream re-routed itself around the diversion bank it left stranded a former section of the original stream. This has provided the opportunity to observe a relatively undisturbed stream course. The dam wall towards the left of the image would have blocked the original stream, forcing it to divert around it. Originally the stream system would not have had clearly defined channels. It would have been characterised by 'chains of ponds' - as shown in this relict section of the tributary that was cut off by the earthen dam bank and preserved from gully erosion. This system would have been quite 'soggy' with sluggish flow during most periods - favouring accumulation of salts in this part of the landscape. 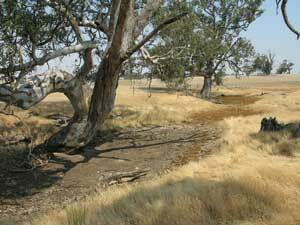 The clearly defined ponds and associated river red gums are shown above during periods of inundation and drought. Relict 'chain of ponds' preserved through diversion of the former stream. These ponds were dry when this picture was taken in December 2006 during the drought. The relict 'chain of ponds' during a wet period (picture taken September 2007). Evidence of former ponds can be observed in the present-day eroded stream channels - indicated by dark organic rich material. Core samples were taken along a number of transects in the sub-catchment. Core depths ranged from 1 metre to over 6 metres - dependant on the degree of resistance provided by regolith materials. Cores were characterised morphologically and also sampled for chemical analyses (pH, EC, chlorides, exchangeable cations, exchangeable aluminium). Core sampling sites are displayed as brown dots on the Regolith/Landscape Units map - developed by John Wilford and Jeremy James from CRC-LEME (Landscape Environments and Mineral Exploration). An EM31 survey was conducted over the study area to ascertain areas that are likely to have relatively high levels of soluble salts in the regolith. EM31 survey results - with the highest measured EC readings being recorded in the alluvial sediments. Regolith/Landscape Units mapped by CRC-LEME across this study area. The major soil types across the study area are show below. On hills and rises with less deeply weathered bedrock the soils are usually Red or Brown Kurosols. These are characterised by strongly acid subsoils but exchangeable aluminium levels are not as high as for soils associated with more extensive Neogene weathering. In the lower parts of the landscape - associated with alluvial sediments and on the footslopes with colluvial sediments - the soils are typically mottled Brown and Yellow Sodosols. These are characterised by sodic and strongly dispersive subsoils that are highly erodible. Subsoils are relatively impermeable and likely to be associated with lateral flow of water. Red Kurosols are associated with the very highly weathered planar Neogene (Tertiary) landscape. These soils are characterised by very strongly acid subsoil horizons - that are also magnesic (i.e. with very low levels of exchangeable calcium compared to magnesium) and have very high levels of exchangeable aluminium. Subsoil horizons are also very well structured, friable when moist and have shiny-faced peds - representing a truncated old soil related to Neogene weathering. This soil can be considered to be part of a remnant ‘pedoderm’ (i.e. a recognisable soil mantle inferred to be a particular age and covering a variety of topographic/lithographic situations). These subsoils are relatively permeable and are likely to be conducive to recharge and contribute to discharge in adjacent seepage areas. The EM survey and associated core sampling confirmed that the highest level of soluble salts are associated with the alluvial sediments and sometimes in the lower parts of the colluvial footslopes. Pre European settlement these salts were most likely stored in 'soggy systems' characterised by 'chains of ponds'. 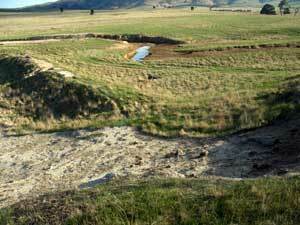 Erosion is likely to be a major cause of liberation of stored salts into the upper tributaries of the Bet Bet Creek catchment that then accumulate lower down in the catchment and affect water quality. There is a juxtaposition of texture-contrast soils in the lower to mid reaches of the study area. Kurosols dominate in upper parts of the landscape - particularly associated with Neogene (Tertiary) weathering. These soils are characterised by strongly acid subsoils, often with high levels of exchangeable aluminium. In the lower parts of the landscape (lower colluvial slopes and alluvial valley floor) the soils are typically Sodosols., characterised by sodic and dispersive subsoils that are highly erodible. The highest recorded salinities in the study area are also associated with these sodic soils in the alluvial valleys. Re-vegetation with perennials should take into account the differences in soil types. High exchangeable aluminium levels in the upper landscape are likely to restrict options - as lucerne, for example, would not be suited. This work has been supported by the CRC for Plant-based Management of Dryland Salinity (CRC-PBMDS) - with particular thanks to Dr Megan Lewis (SA). It forms part of a collaborative approach between CRC-PBMDS, CRC-LEME (John Wilford and Jeremy James) and Mark Reid (DPI, Bendigo). Dal and Rod MacErvale, Rob and Lyn Bright and Peter Wheeler (landholders) must especially be thanked for allowing access to their properties.